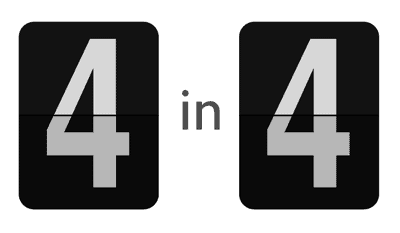 On August 24th, the current ITP community will embark on another 4-in-4 event, every participant creating four different creative projects in four days. Each day’s project will be crafted, named, documented and shared publicly in just one spin of the globe. As an instigator of this madness, I just launched a collection of information for those participating in or running a 4-in-4 event. This new 4-in-4 Guide tells what it is, how to run one and offers some advice for participants. Think of it as a starter mix from which you can cook up your own 4-in-4. It’s a work in progress. Comments and suggestions warmly welcomed. Also, look for the upcoming bonsai version, a 1-in-1 event for alumni and students at ITP’s 30th Anniversary celebration, all day on October 2nd.